There is a group of non-green flowering plants that is related to the heaths (blueberries, cranberries, rhododendrons) and is often included in the heath family (Ericaceae). This group of non-green plants is a subset of the heath family. Let's call them the monotropoids. Are they parasites? Yes, but in an unusual way. The monotropoids were thought to be "saprophytes." 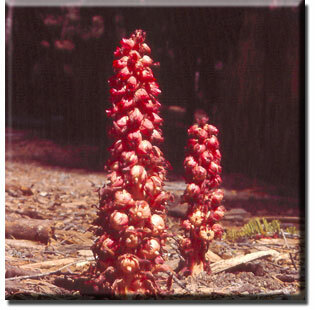 A saprophyte lives on dead plant or animal material, but the monotropoids don't do that. They are parasites on fungi, we can call them mycoparasites. But they don't kill the fungi. The fungi infect the short, stubby roots of the monotropoids, and transfer food and water into the roots. The fungi live in the dense litter of dead leaves in wet forests.